I'm back in London after an amazing month in the Philippines launching my book, meeting people from all walks of the children's book industry, and learning so much about books and reading in my own country. I was lucky because I arrived in time for National Children's Book Day - which is celebrated every third week of July to commemorate the publication of our national hero Jose Rizal’'s first picture book The Monkey and the Turtle in 1896 (interestingly it was published in a London publication, Trubners Oriental Record!). 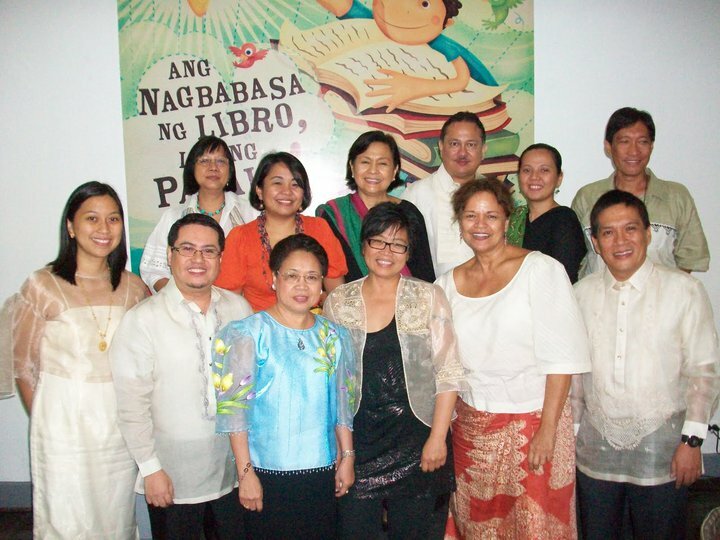 I delivered the keynote address to the Philippine Board on Books for Young People at the Museo Pambata. Here it is - I only wrote an outline sort of text and did a bit of ad-libbing so this is not exactly as delivered but the heart of it is all here. All you amazing people are here today because of one thing: Books. And the only reason I am here standing before you today, wow, delivering a speech with my hair combed and wearing this lovely if itchy outfit is because of one thing: Books. I am here because last month, something amazing happened to me. 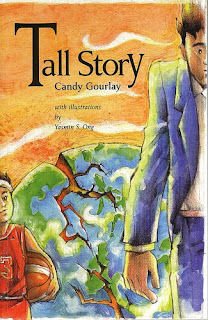 My book, Tall Story, was published by Random House in the UK and the reviews so far have been fantastic. When dreams come true, it doesn’t get any better than this. Tomorrow, something even more amazing is going to happen. Another dream is about to come true - something I’ve been dreaming of since I learned to read: Tall Story is going to be published in the Philippines! I can still remember the excitement and thrill of realizing that several words made a sentence and several sentences made a paragraph and paragraphs made chapters and chapters made wonderful satisfying stories called novels. I was six years old and I was delighted. I remember that feeling so well. And wouldn’t it be wonderful if a child opened a book that I wrote and was just as amazed and delighted. When you are learning to write – and I have discovered that learning to write never ever ends – you get a lot of unsolicited advice. The first piece of advice of course is: if you want to write, write. No problem. I’m a journalist. Madali lang yan That’s easy. When I was the London correspondent of Inter Press Service (a news features service for the developing world), I wrote two 600-word articles a day and still managed to get home by 5.30 to cook dinner for my family. Marami pang ibang advice There’s a lot more advice. Show don’t tell. Don’t write the boring parts. Write what you know. With my first novel, I wrote what I knew. My hero was a 13-year-old English boy who liked to skateboard ... very similar to my skateboard mad son. My setting was the neighbourhood in North London where I live. But my character time-travelled to World War II, which I knew nothing about. So I researched World War II. It took me three years to write the novel. It was rejected by maybe many literary agents and publishers before an agent took me aside. 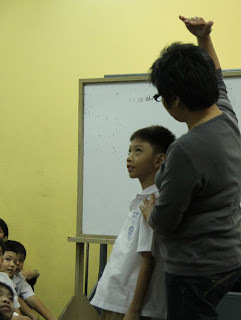 She said, why are you writing about an English boy with an English setting when you are a Filipino? The agent told me that a debut novel had to have a lot of the author in it. The fact that I was Filipino made it difficult to sell the character, setting and concept of my novel. The issue was practical: the publisher would find it hard to market a Filipino author whose novel shows no sign of her identity. That was the point when I gave myself permission to put the Philippines into my writing. But it was still a long journey – it’s nine years since I became serious about writing for children. And I had to write three more novels before Random House bought Tall Story. During the time I was writing and writing – and getting rejected at every turn – throughout, I had the sense that I was learning a very important lesson but it was hard to put it into words. It’s not about writing what you know, It’s about writing WHO YOU ARE. If you were to read Tall Story, or any of my other novels (which I hope someday will also see print), you would see what I mean about writing who you are. 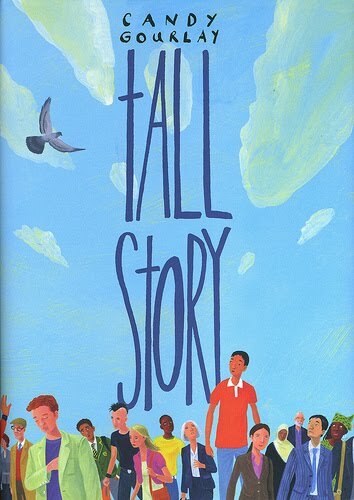 In Tall Story, a boy yearns to be with his family who lives in the UK. In Volcano Child, a girl yearns to be with her mother who works as a maid in England. In Ugly City, a dystopian fantasy, parents must go and children must stay. 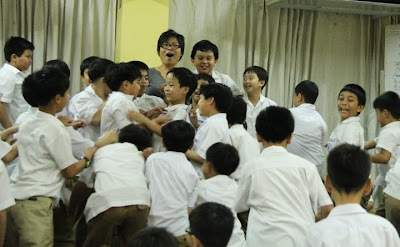 Clearly, who I am is someone who misses her family. 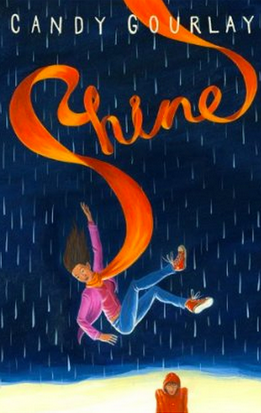 All good books should be about write who you are. What about children’s books? 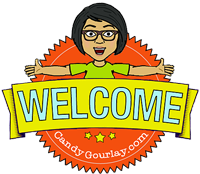 Why do I write for children? What makes them so special? 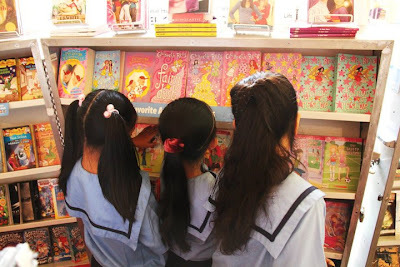 Girls rush for the pink shelves at a book fair in Angelicum School. When you think about it, a child’s reading experience must be so pure – everything is fresh and new and never been heard before. Adult readers by virtue of being adults, view stories through the prism of their PAST. Children have no past – so for a child, reading is about the FUTURE. It’s aspirational. 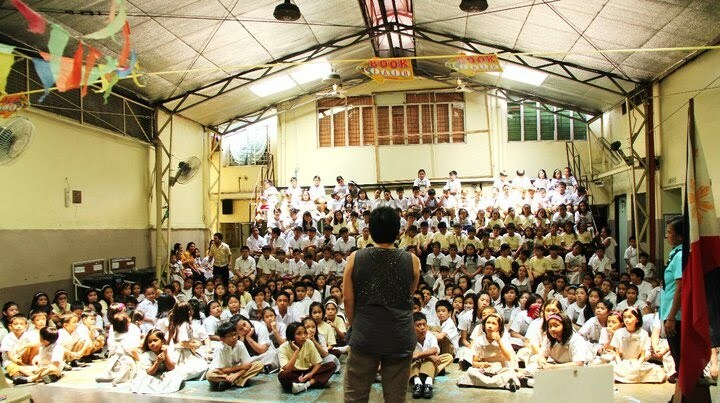 When children read, they ask themselves, who am I? Can I be that character? Can I wave a wand and make magic? Can I fly? Can I go to far away and secret places? "If a child can’t find himself on a page early in life, he will go looking for himself in all the wrong places." This is why we read to our children (and if you don't, it's never too late to start): We are helping them find themselves. When a child of any age listens to the voice of a beloved adult reading anything - an ABC book, a chapter book, a picture book – it is not just a voice that he is listening to; he is listening to an older generation. An older generation whispering about the possibilities that lie ahead. Of what he or she can be, of what he or she can do. We must read to our children for as long as they will let us. Reading is not a passive act. It’s a dialogue. It’s a relationship. When we read to our children, we take them by the hand and lead them to a better place. Words on a page nurture IMAGINATION like no other media. The reader is not handed a fixed prescription of what characters and setting look like. There is no theme music to tell the reader what emotion to feel. Reading demands a certain vision – that the reader create the scene, be the character, feel the feelings. And what is imagination but the ability to see one’s self outside the narrow world that we live in? Imagination enables us to BELIEVE that our world can be a better place. It empowers us to conceive of a future far greater and better than the one that we live in now. And if we can imagine it, maybe we can make the world a better place. 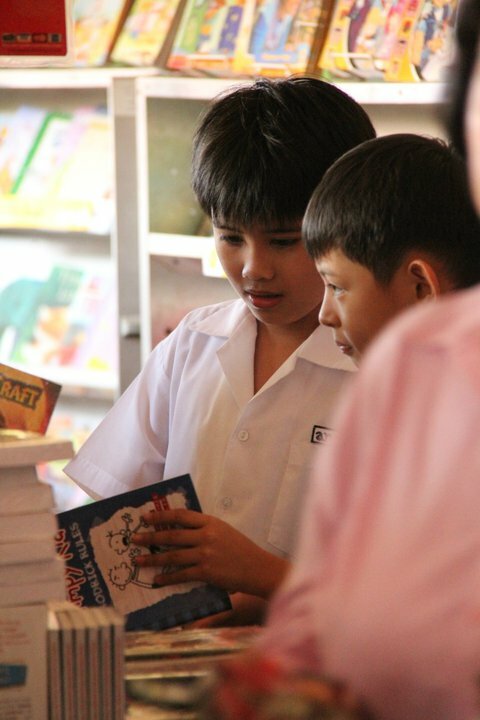 Think of a Philippines in which all children love to read ... and because they read, all children can imagine a Philippines without chaos, without violence, without corruption, without poverty. And think of the future that children like that will build. 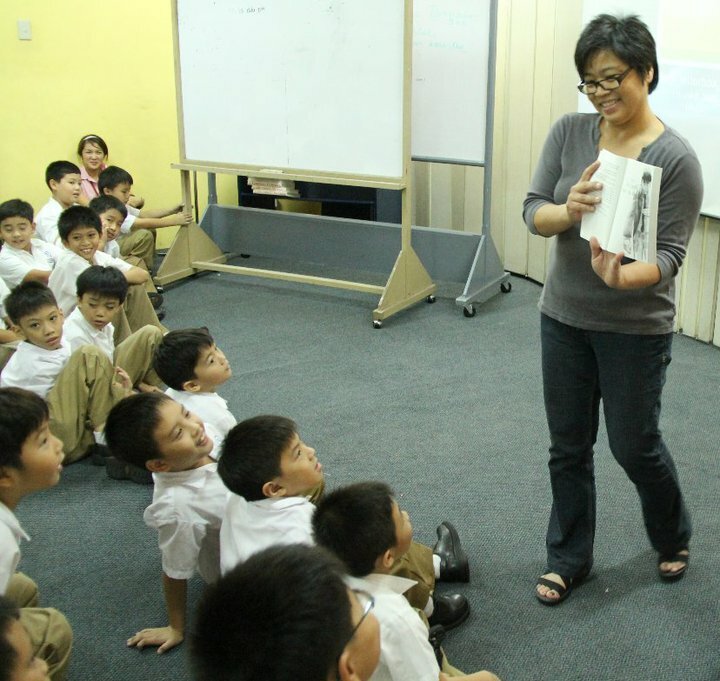 Imagine what a GREAT nation we would be if ALL our children read books. But these are difficult times for the children’s book industry. Children’s Books have become a global industry dominated by massive publishing houses based in rich countries. Money can only be made if a book can be sold to many different cultures and as a result, there exist picture books in which car steering wheels are not on the left or on the right but in the middle - so that the book can easily be sold to another country. Books become global brands - generic to the masses. In England, where I live, you will find it hard to find a picture book featuring the icons of British culture – the red pillar mailbox, the double decker bus, even certain kinds of common birds … because for a global business there’s no money in a book that can’t be resold to another country. In the UK, publishers are very worried about the e-book, the iphone and the ipad, and wondering what impact the new technology would have on books made of paper and glue. Here in the developing world, such gadgets have created a technology gap. If reading requires expensive hardware, who, in a country that struggles to feed so many mouths would be able to afford to read? If a child can’t find himself on a page, he will go looking for himself in all the wrong places. Children are only right to ask. There are so many other things for them to do. There’s the cinema, there are DVDs, there’s the internet ... this young generation has entertainment on tap. They are technically skilled in a way that people of my generation and older cannot even begin to imagine. They are, frankly, awesome. So why should they read? And why should you, teachers, librarians, poets, illustrators, authors, parents, why should YOU encourage them to read? • You should read because one life isn't enough, and in the pages of a book you can be anybody. • You should read because the words that build the story will become yours to build your life with. • You should read not for happy endings but for new beginnings; You are just beginning yourself and you could use a map. • You should read because you have friends who don't, and young though they are, they're beginning to run out of material. • You should read because every journey begins at the library, and it's time to start packing. • You should read because one of these days you’re going to get out of this town, and you’re going to go everywhere and meet everybody, and you want to be READY. You should read because YOU are Harry Potter, YOU are Spiderman, YOU are Nancy Drew. You are Edward of Twilight, Oliver Twist, Bernardo Carpio, Pippi Longstocking, Jo March in Little Women, and Darna. The hero of this story we are living in, this world, is YOU. And oh how this world needs heroes like you. Amazing speech and awesome pictures. truly inspirational!